Only two days ago, I was shocked and horrified to learn that my dear friend Jessica Cangiano of Chronically Vintage has lost her house and all of her belongings to a devastating house fire. Tony, Jessica, and their pup Annie escaped safely with minimal smoke inhalation, but sadly it appears that their precious cat, Stella, was lost in the fire as they have been unable to locate her. They were unable to save anything more than their phones and the clothes that they were wearing. Their property was completely gutted. The fire swept away everything they owned, including Jessica’s livelihood of her Etsy shop. 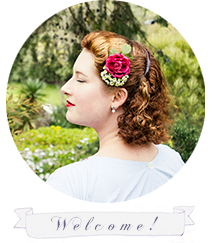 I’m sure most of you know Jessica through her blog ~ she is a gracious, kind, and an incredibly generous member of our global vintage & blogging community, the sweetest girl that is friend to one and all. So if you wish to help out, here are some things that you can do.